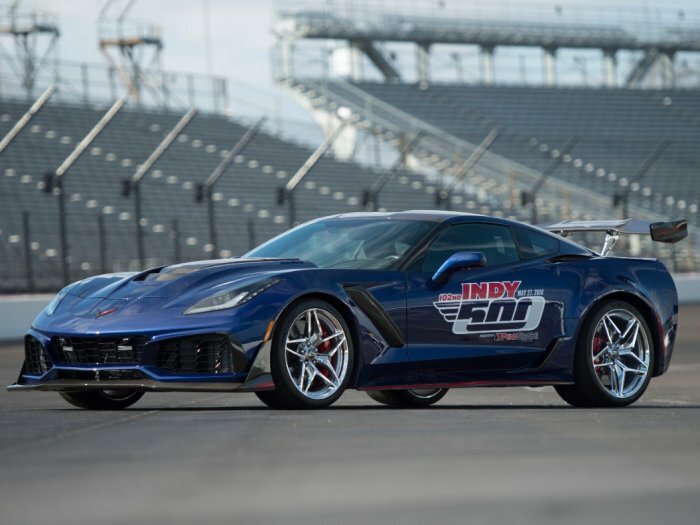 A Chevrolet Camaro or Corvette has served as the official pace car of the Indy 500 every year dating back to 2004, so it comes as no surprise that the 2018 running of the legendary American open-wheel race will be paced by the most powerful Corvette ever – the new ZR1. For a very long time, the Indy 500 pace car routinely shift from one company to another, but the last time that a non-General Motors product led the field was back in 1996 when a Dodge Viper was the official Indy pace car. Since then, 21 GM vehicles have served as the Indy 500 pace car, including three Oldsmobile models (Aurora twice, Bravada once) and 19 Chevys (Monte Carlo once, SSR once, 11 Corvettes, 5 Camaros). Prior to 1996, the maker of the Indy 500 pace car changed from year to year, but since the first Chevrolet paced the field back in 1948, a variety of vehicles led the field in the years leading up to the current string that started in 1997. Of course, during those years from 1948 through 1997, 19 other GM vehicles from the Oldsmobile, Pontiac, Buick and Cadillac brands have served as the Indy 500 pace car, so in the last half-decade, GM has had more Indy 500 pace cars than anyone. While Chevrolet vehicles have become the most common pace cars for the Indy 500, the Chevrolet name has appeared in the race in the past. Back in 1911 Arthur Chevrolet competed in the very first Indy 500 with help from brother and automaker founder Louis Chevrolet. In 1920, Gaston Chevrolet won the Indy 500. More recently, Chevrolet has become one of the most successful manufacturers in the world of Indy Car racing, winning the last six manufacturer’s championships. In 2017, a Chevrolet-powered car won 10 of the 17 races on the season. The 102nd Indy 500 will be run on Sunday, May 27th 2018 and the race will be broadcast on ABC. I hope the Indy cars can keep up with the 2019 Corvette ZR1. Let's see how they do. When is the date?